RIO Products has announced the release of a competition-legal nymphing line, designed with an ultra-thin diameter, low stretch, and a supple core that maximizes sensitivity and allows faster hook sets. 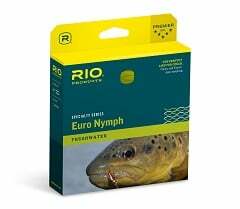 February 3, 2013 (Idaho Falls, Idaho) – RIO Products, industry-leading manufacturer of fly lines, leaders and tippet material, continues to keep pace with industry trends by introducing its Euro Nymph line. The line is designed for all short line European nymphing techniques, including French, Czech, Polish, and Spanish styles. The Euro Nymph line was conceived by nymphing specialist Steve Parrot who saw the need to develop a competition legal line that worked for all types of European nymphing. The line is built on an ultra-thin diameter, low stretch, and supple core to maximize sensitivity and allow extremely fast hook sets. A highly visible orange tip helps anglers detect even the slightest take, which is often what it takes to win competitions. Offered in a single size, the Euro Nymph line has both a front and rear welded loop and XS technology to easily slip through guides. This floating line comes in moss with an orange tip and can be found at all RIO dealers for a retail price of $59.95.